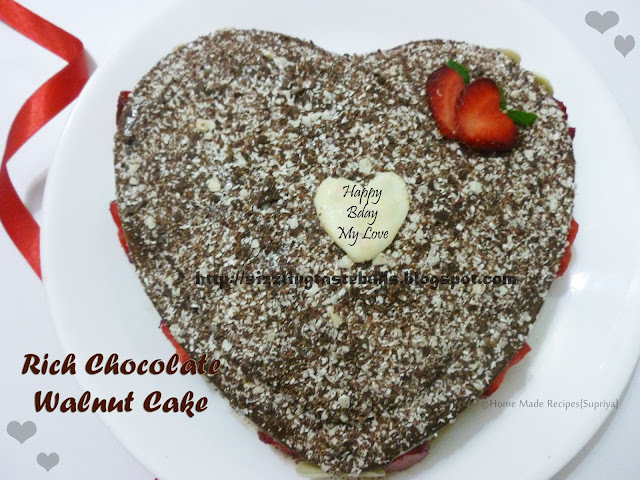 This post is dedicated for the most wonderful person in my life - My HUSBAND. Last week was my Hubby's Birthday and I thought of baking this cake for him this year. 1. Bring condensed milk, butter, yoghurt, milk to room temperature. 2. Sieve Maida, Cocoa powder, Baking Soda and salt together. 3. Beat Butter,sugar and Yoghurt till light and creamy. 4. Fold in the seived ingredients, alternating milk and condensed milk. Add chopped Walnuts. 5. Grease and dust the baking tin and preheat the oven to 180C. 6. Bake for 25- 30 mins till tooth pick inserted in the centre comes out clean. Allow it to cool for 5 mins and remove onto a wire rack. 1. Mix butter, cocoa and condensed milk and beat well. Microwave this for 20 secs and mix thoroughly. 2. Spread over the cake and leave it to set. 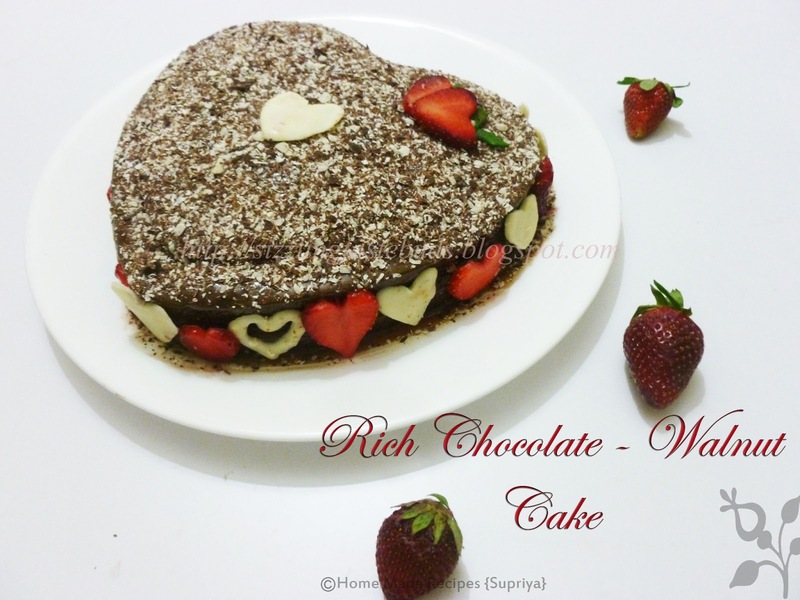 Decorate it with grated White and Dark Chocolate. Cake looks absolutely beautiful. Your husband must have really enjoyed it. 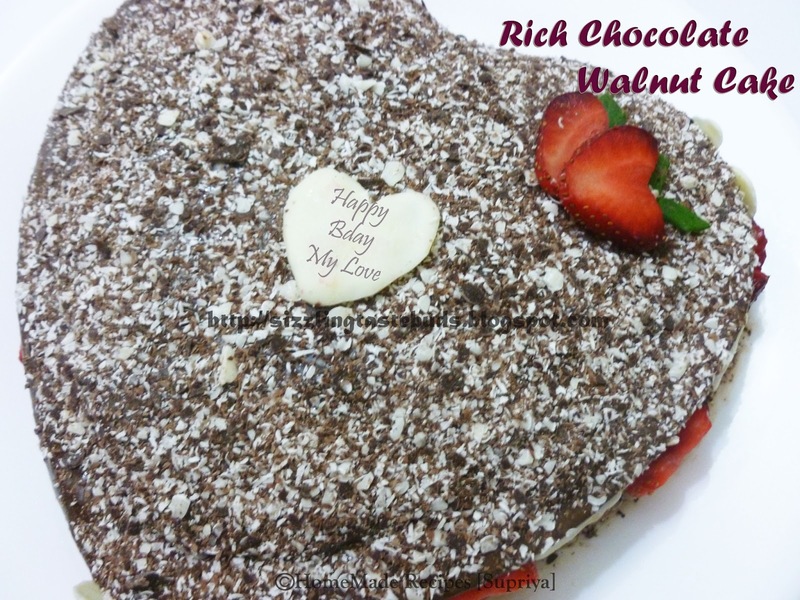 Walnuts are perfect match for the cakes..The cake looks delicious and appealing!! Love the deco, unique and stunning. The hearts definitely symbolizes love and am sure your husband must have been impressed.